Yesterday I published a post in which I taught 16 phrasal verbs which belong among the 50 most frequent phrasal verbs in English. 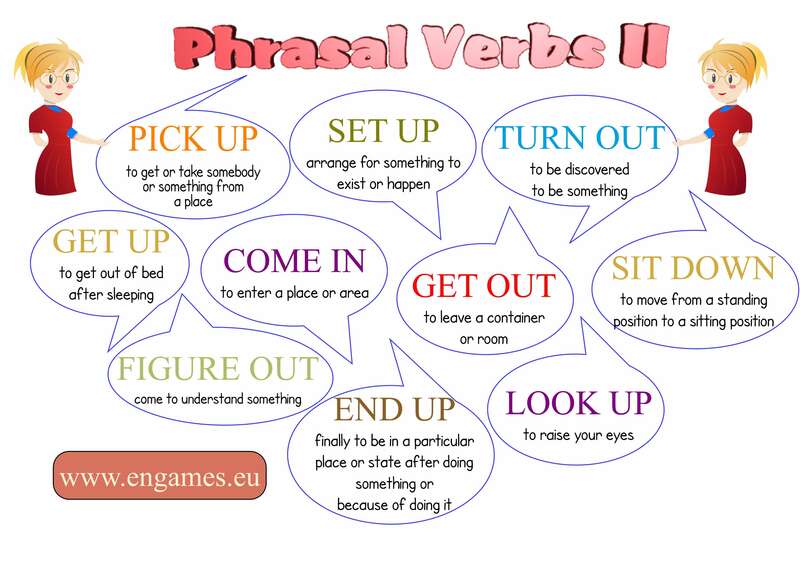 In this post I am going to introduce 10 more phrasal verb which belong into the same category. Start with a quiz to see how many of the phrasal verbs you know. If you score 10 points, it is no use to spend your time on those explained here. Please sit ___ and have a drink. The alarm clock rang and she got ___ and put on her clothes. Despite all his efforts, he couldn’t figure ___ what had happened. He looked ____ from his breakfast and greeted her. He ended ___ having to sell her house after her divorce. She opened the door and he came ___. A new government is being set ___. Can you pick me __ on your way home from work please? Her suspicion turned ___ to be justified. Could you help me get ____ of this place? If you have not scored 10 points in the quiz, it is time to learn the phrasal verbs. Study the following infographic and try to remember the words. This delightful quiz game is perfect for teaching or revising phrasal verbs. A grid is drawn on the board with points at the top and verbs down the side. The students play a quiz game by guessing phrasal verbs from their definitions. The first student to raise their hand and give the correct phrasal verb wins that square for their team and the amount of points in the square. The team with the most points at the end is the winner. As an extension, when a student answers correctly, the team makes a sentence using the phrasal verb. If it is correct, they receive double points for the square. Thank you. This looks wonderful. Thanks a lot for your beautiful and helpful article, its a great Idea to learn not only phrasal verbs but also new words. In this memorable teaching activity, students write sentences with phrasal verbs. The class is divided into small teams. The teacher writes a verb on the board. In their teams, students have five minutes to write as many sentences as they can, using the chosen verb as a phrasal verb. After five minutes, the teacher asks each team for their sentences. For each sentence where the meaning of the phrasal verb is conveyed correctly, a point is awarded. The team with the most points at the end of the game wins. Look up is not a phrasal verb here. It depends on the definition of a phrasal verb. I think, that nowadays most scholars stick to the definition that the a phrasal verb simply consists of a verb and a preposition.